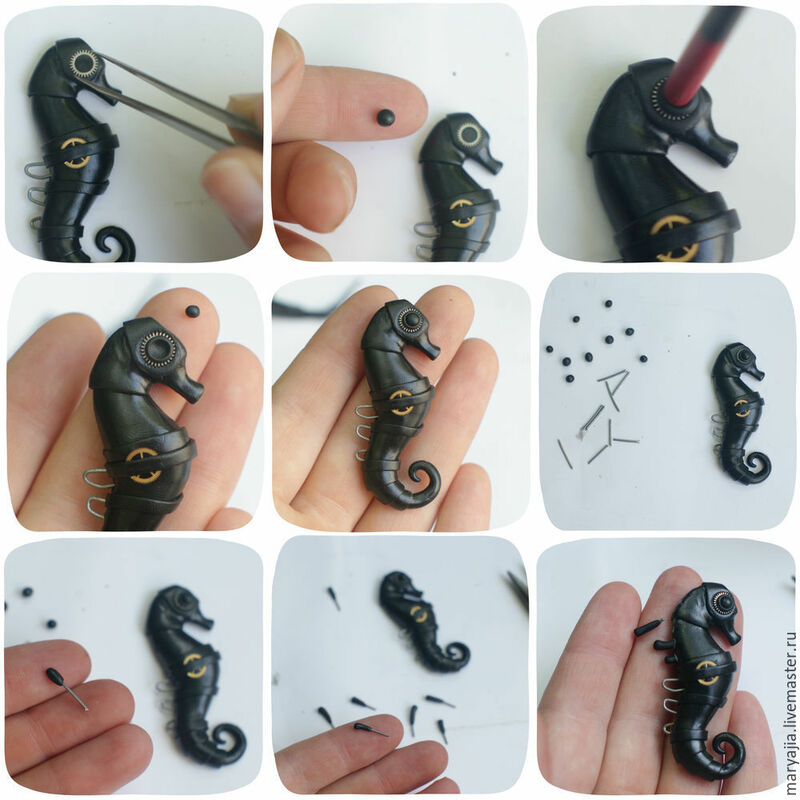 Today I decided to share with you my passion for the sea with this Polymer clay Seahorse DIY step by step tutorial. Ever since I was a child I was always fascinated about the sea and the sea creatures, especially the seahorses which are so majestic and intriguingly beautiful. I have always viewed them as little unicorns from the sea. 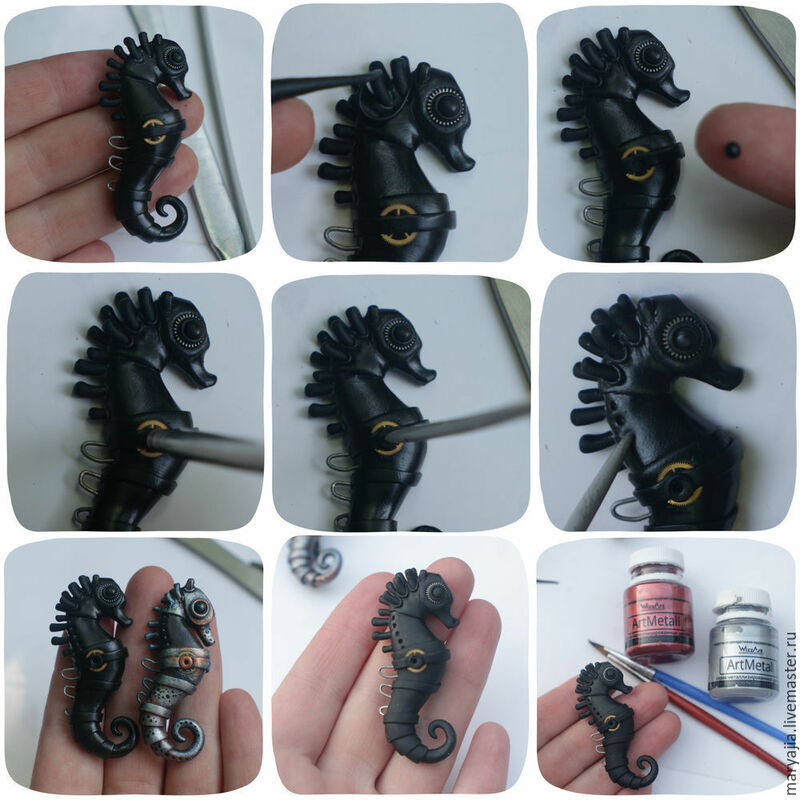 To add some uniqueness to our seahorse we will use some biomechanical details. 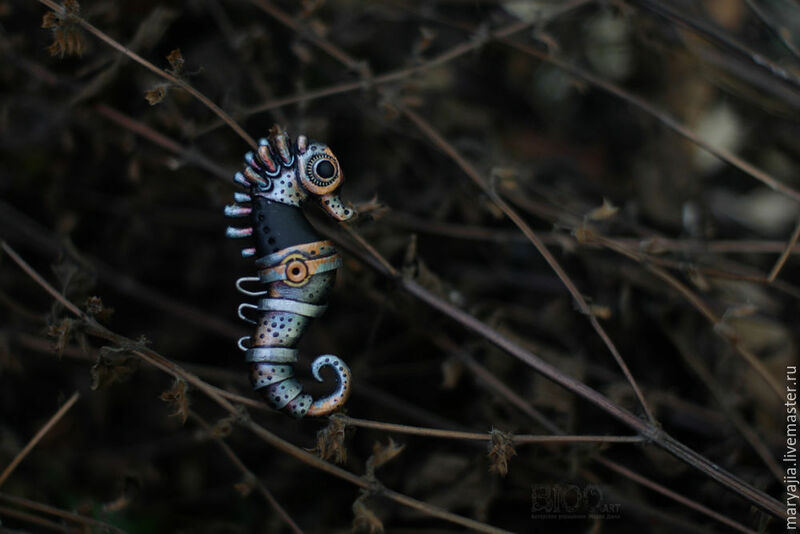 This Polymer clay Seahorse DIY step by step tutorial will definitely enrich your creativity. 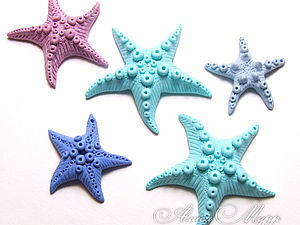 Polymer clay – the color of your choice – I recommend black or any dark color. 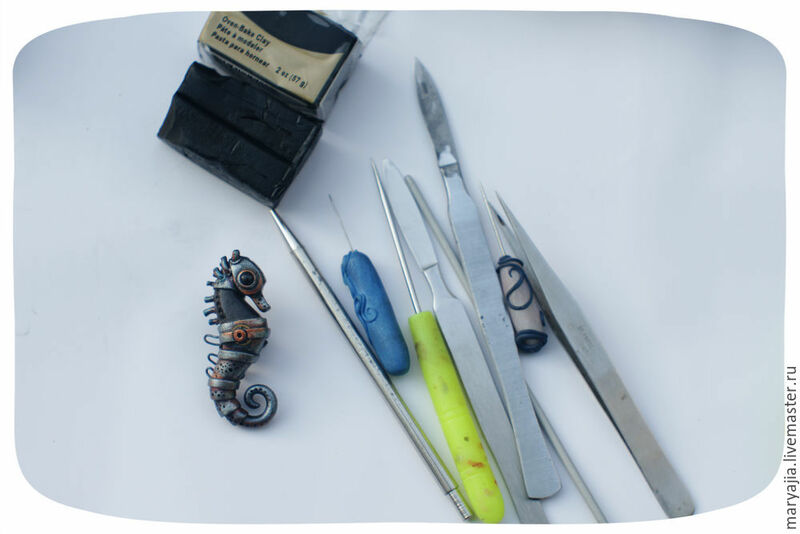 Basic tools – scalpel, a pair of knitting needles of different sizes, a needle, a toothpick, synthetic brushes. Metallic wire for the ridge on the back. 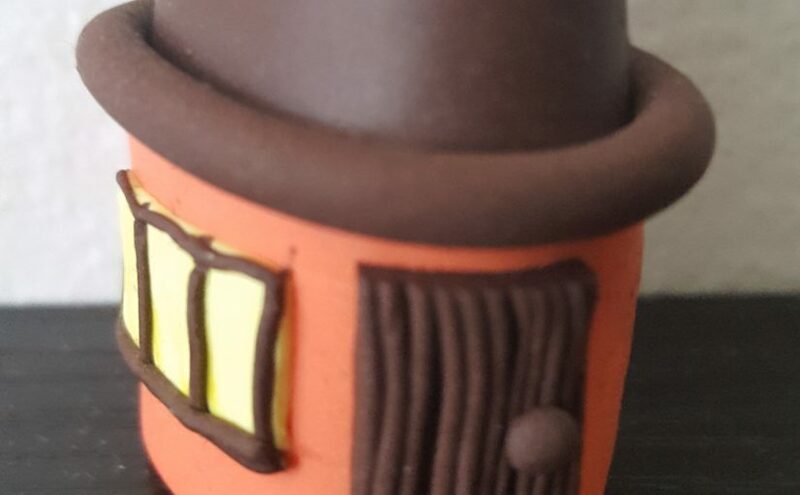 Start by forming a medium cone out of the clay. 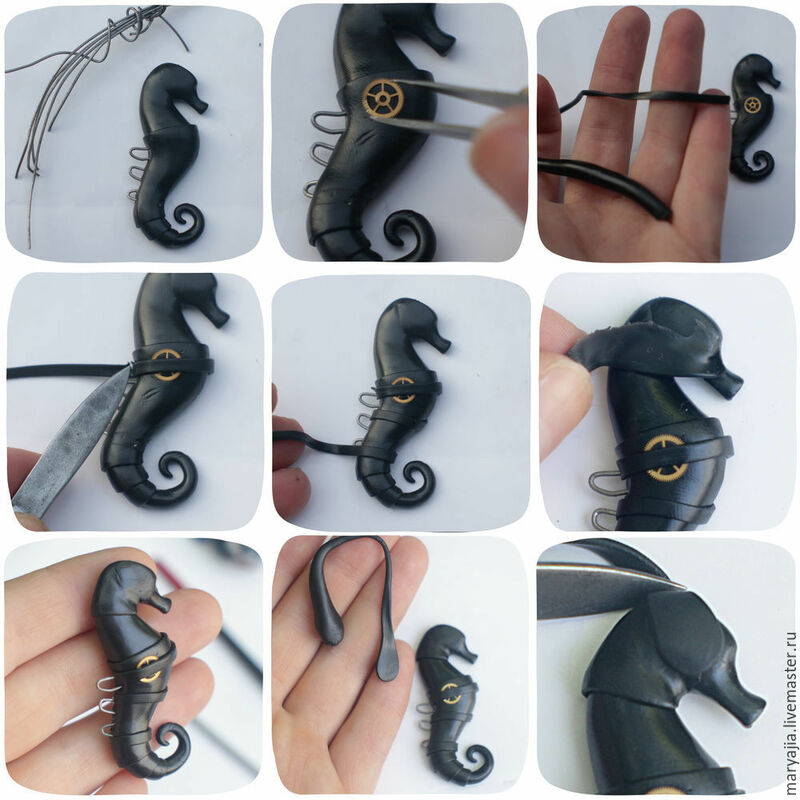 Try to shape the seahorse body as you can see in the image above using your tools. Look at a picture with an actual seahorse or the final one from this tutorial. This will help you get a better form. 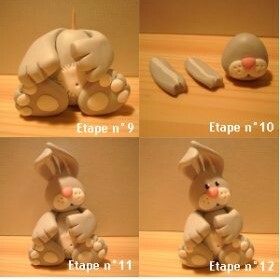 For the next step you will have to use rolled thin layers of polymer clay to make stratifications on the tail. This creates an interesting effect of metal plates that are placed one on top of the other. As you can see in the images underneath if you cut and roll into the body the part that will be under the next layer you will avoid the irregularities that can appear. This way the final seahorse will be more accurate. After this step, start forming the ridge by using the metal wires and fix them in the lower part of the back. Right now, if you could find a gear, you place it on the body, close to the middle. Using another thin pressed bundle, you will wrap it around the body going over the gear and between the metal wires. Also, add another layer to distinguish the neck, and another oval one in the place where the eyes will be placed. 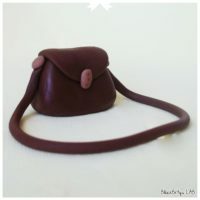 To create the eye, you need to use another gear in which you place a small clay bead. Crush it in the middle with the rounded end of one of the tools (maybe the end of a brush). In the space created you place another smaller bead. So there you have it! Now, for the upper side of the rige you will have to cut small pieces from the metal wire which you will partially wrap in clay. Bake them before you stick them in the upper back of the seahorse. This way they will not be deformed by the pressure of your fingers. Another detail, similar with the eyes, will be made on the gear placed on the body of the seahorse. Use the same tool to create a space over the wrapped gear in the middle of it. You will place in that space a small bead which you will crush again to make a small circle inside the gear. Before the painting process you have to bake the seahorse. 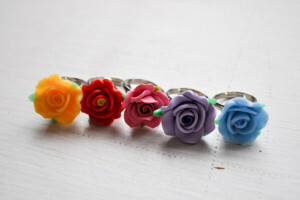 You need to bake it as it is required for the type of polymer clay you are using. They always come with instructions, so you can find it all there. 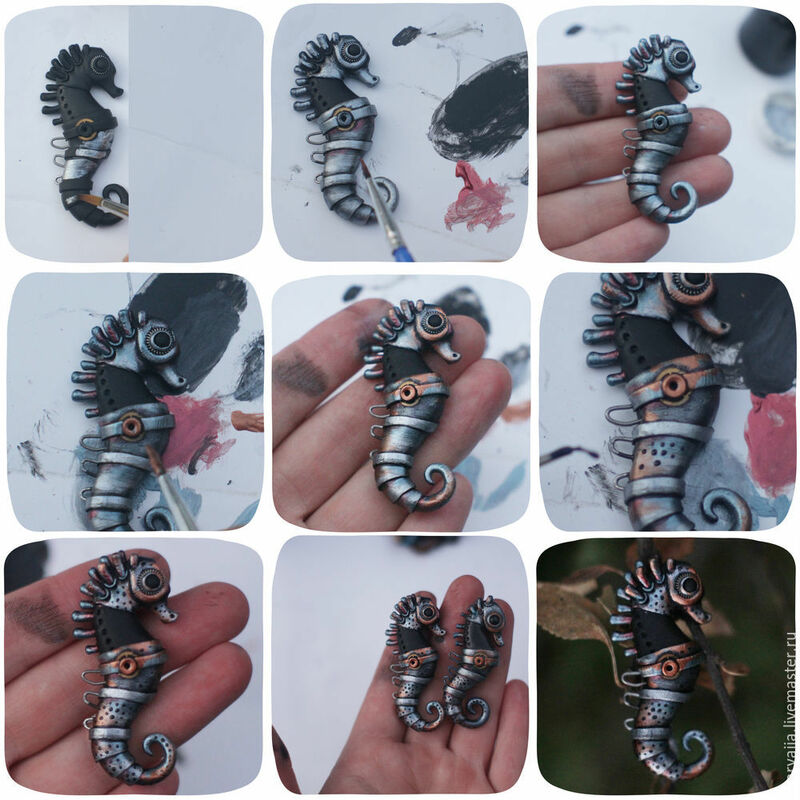 Getting closer and closer to finish with this Polymer clay Seahorse DIY step by step tutorial. You can start by painting the body then go up to the head and ridge, using a dry brush. To create that texture of the metal you should steer the acrylic paint on a pallet to remove the unnecessary moisture. This way the paint gets more density and gives you the desired result. In the lower spaces, between the wraps on the body you can add some shades. 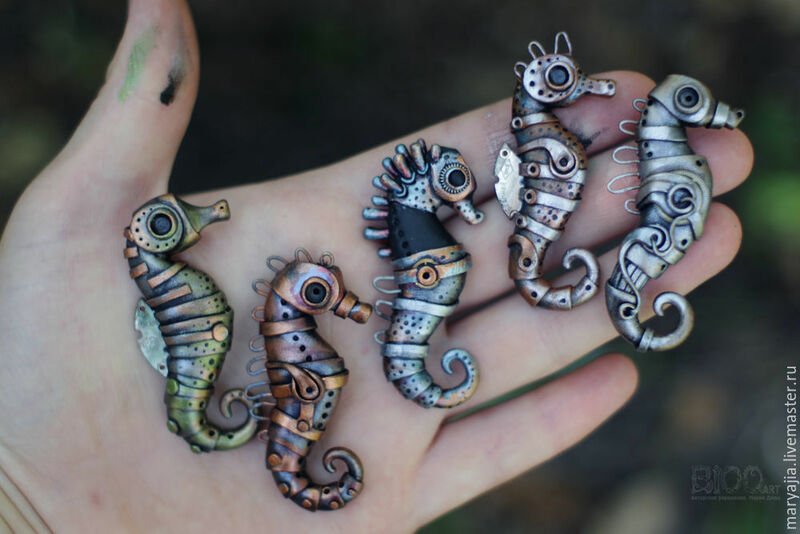 Diversify with red, copper and metallic blue-gray so the seahorse becomes more bright. With a thin brush add some dots over the body and head and bring the seahorse to life. They look just great, aren’t they? 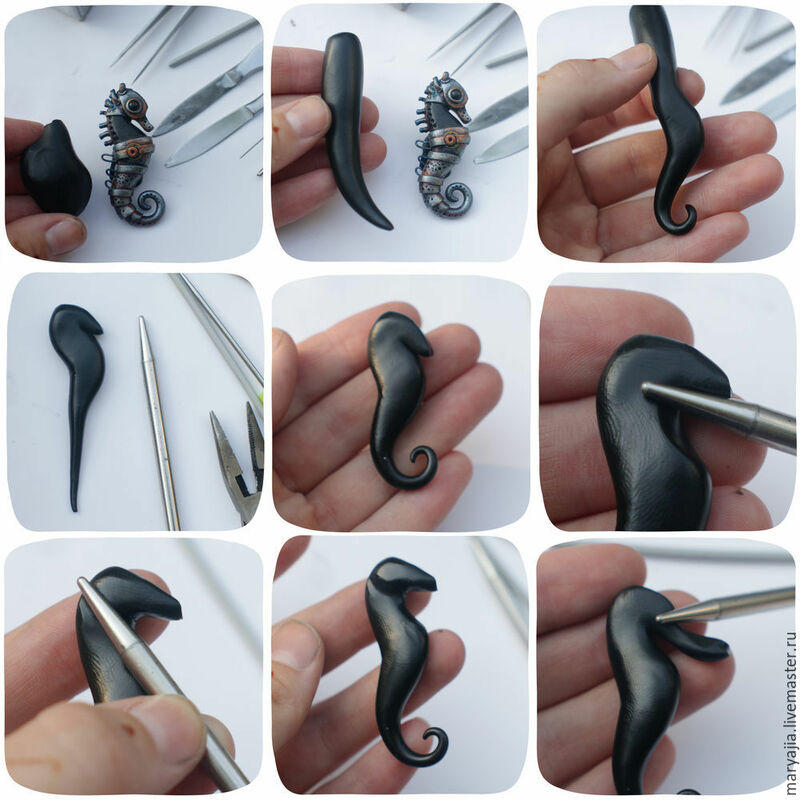 This Polymer clay Seahorse DIY step by step tutorial is definitely worth trying. 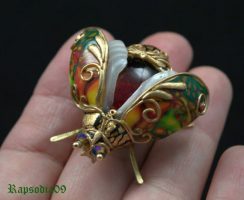 I would love to have a brooch with one of these little ones. How would you guys think to use it? 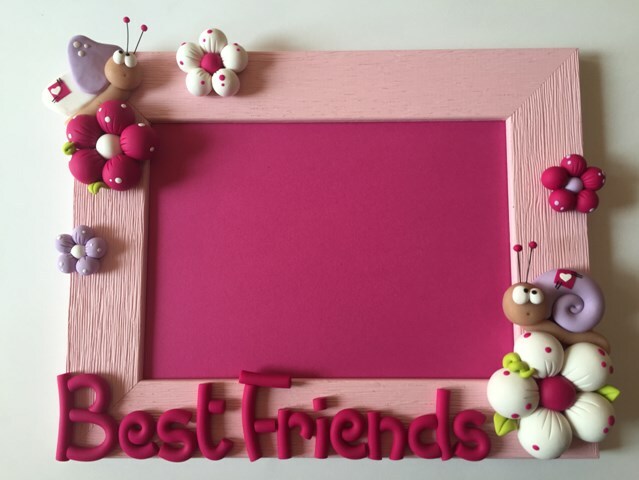 If you liked this, you can always leave us a comment and don’t forget about our Pinterest page, where you can find more tutorials and ideas. I found my inspiration for this tutorial here.